Our company is an eminent name, which is counted among the top Manufacturers and Suppliers of Progressive Distributor. One can use it as primary as well as secondary distributor. 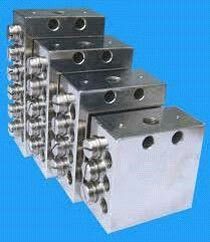 The input quantity of lubricant is divided as per the outlet ports combinations in Progressive Distributor. The best thing about this distributor is that it works on progressive principle according to which, no lubricant goes to next outlet unless metered quantity of lubricant is delivered from previous outlet. We make available Progressive Distributor in Model 2, 4, 6, 8, 10 & 12 outlets with respect to output in CC from 0.2 CC to 0.5 CC/outlet/cycle. All the models of Progressive Distributor are equipped with an indicator pin which moves to and fro in one cycle.